Clearly I’m on a bit of a grilling kick lately. While this week has been a very rainy one, I was able to get these gorgeous N.Y Strip Steaks from Claytons Organic Beef on the grill before the storms. 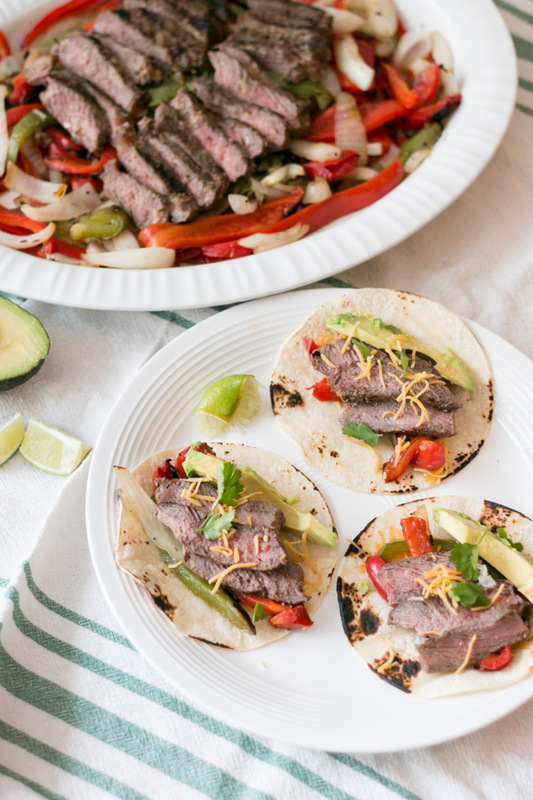 These Grilled Steak Fajitas are such an easy and flavorful meal perfect for any night of the week. Would you believe me if I told you that you could prep and cook up these incredible Grilled Steak Fajitas in 30 minutes or less?! Oh and you never have to turn on your oven either- everything is cooking right on the grill. The ingredients are simple allowing the flavors of the high quality beef and fresh peppers and onions to stand out. My family is a meat loving family and steak happens to be a favorite of mine and my husbands. I’ve been using Claytons Organic Beef for years now but mostly the ground beef so I was thrilled to try the steaks for this recipe. When cooking for my family I do my best to choose meat products without any antibiotics or added hormones, that are humanely raised and organic when possible. I have to say that I am so happy that Shop Rites exclusively carry Claytons Organic Beef. 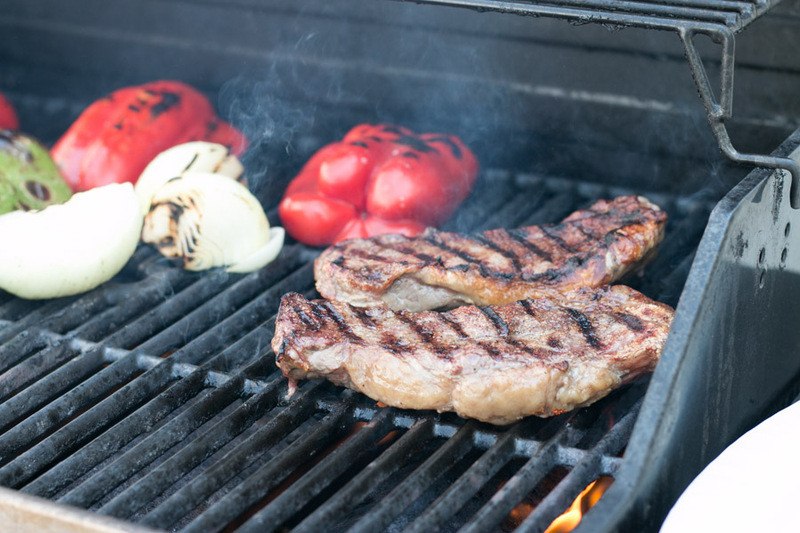 From these N.Y Strip Steaks to ground beef to tenderloin and so much more. This is a brand I trust and one that is affordable too! For these fajitas I simply seasoned the steaks with salt, pepper, garlic powder and a little chili powder. The same seasoning with a little drizzle of olive oil went on the veggies too. All you need is a nice hot grill and less then 15 minutes! Depending on how cooked you like your veggies they can take anywhere from 10-12 minutes. The steaks are so fast- just 4 minutes on the first side and 2-3 on the the second. That char is incredible! Juicy, tender and incredible flavors in these steaks!! The flavors you get from grilling are just so incredible and that a huge part of why I truly look forward to spring/ summer grilling season! Definitely let the beef rest for several minutes before slicing allowing all the juices to evenly redistribute. 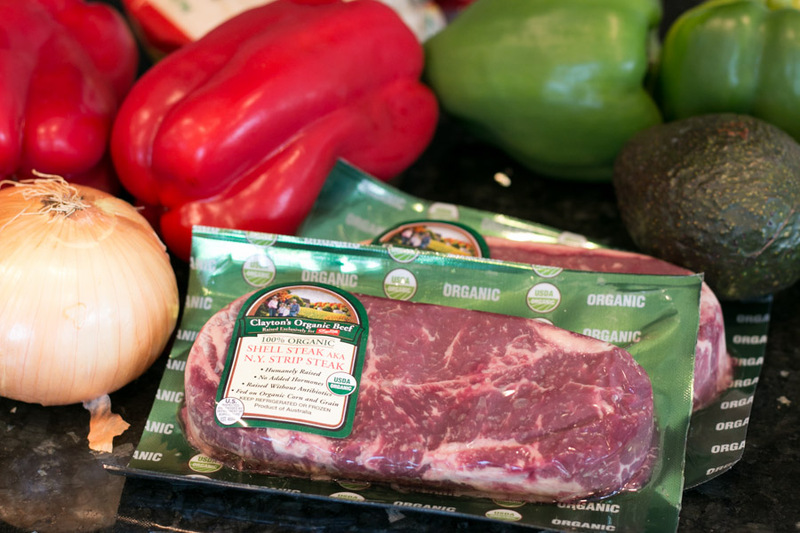 Thinly sliced bell peppers, onions and that perfect steak- you’ve got yourself a great meal! Now I love corn tortillas for any sort of taco or fajita. A little trick to make them more pliable is to warm them a bit in the microwave or like I did right on the grill. Again- that char is heaven! You can certainly sub flour tortillas if you prefer. To serve these beauties I layer on some thinly sliced steak, peppers, onions, a sprinkle of shredded cheddar, a slice of avocado and a sprig of cilantro. As always, I have my fresh lime on hand for a little brightness. You all have got to head over to your local Shop Rite and try these Claytons Organic Beef steaks, you won’t be disappointed! Heat your grill over medium high heat. Drizzle the veggies with a little olive oil and sprinkle with salt, pepper, garlic powder and chili powder (optional). I like to remove my steaks from the fridge about 15 minutes before cooking so they are not as cold when they hit the grill. Season each side with salt, pepper, garlic powder and chili powder (optional). I like my veggies a little more cooked so I place them on first and let them cook a few minutes before getting the steaks on. Place the steaks on and grill for about 4 minutes on the first side. Flip the veggies and steak. Cook the steak on the second side for 2-3 minutes. If you are not comfortable with knowing when the meat is ready definitely get yourself a meat thermometer. Set the veggies and meat aside. Give a little char on the corn tortillas then wrap them in a kitchen towel. Thinly slice the steak, peppers and onions. Assemble away! A corn tortilla, sliced steak, peppers, onions, cheddar, an avocado slice, cilantro and a squeeze of fresh lime. I’m super thrilled to be working with Claytons Organic Beef for a multi recipe collaboration so stay tuned for a new recipe featuring Claytons Organic Beef over the next few months! Its going to be delicious!! I love the char you’ve gotten on those veggies and the steak is perfectly done! Fajitas are always a favorite here at the house and grilling in (as opposed to going out) makes for a better meal! To me there is such a noticeable difference in the quality and flavor of organic meats, so I also try to get brands like Clayton’s. 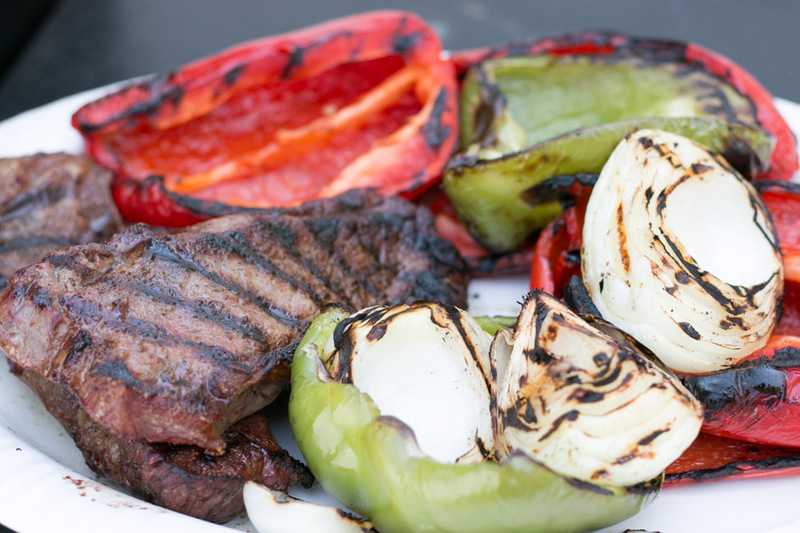 You fajitas recipe is just perfect for the summer…break out the grill! I love marinades on meat but if you use good quality meat then all you need is some salt and pepper. I love that you keep it simple so all the flavors can really shine! Fajitas are the best! I love the idea of using steak in them! One of my MOST favorite meals!! That steak looks so delicious! Fajitas on the grill are the best! And I love the grilled veggies! So fresh and delicious! Enjoy! I’m bookmarking these to try this weekend! Make-your-own type of meals work well with my family, since everyone has such different tastes. Love that I could just set up a fillings bar and let everyone have at it! I love that! This is definitely a family pleasing meal! Fajitas are my favorite, even better when they’re grilled! Organic is totally the way to go with steak. I couldn’t agree more!! This brand is fantastic! The quality and flavor is what I look for for my family. 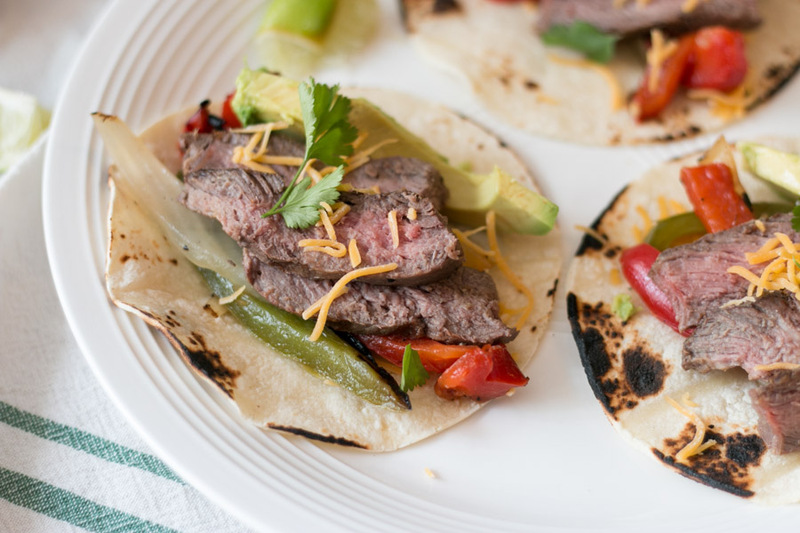 Fajitas are one of our favorite family meals, especially during grilling season. Finding good, quality, organic meat is key, too. You can really taste the difference. I agree! There really is an incredible difference and knowing I am giving my family high quality beef is really important. 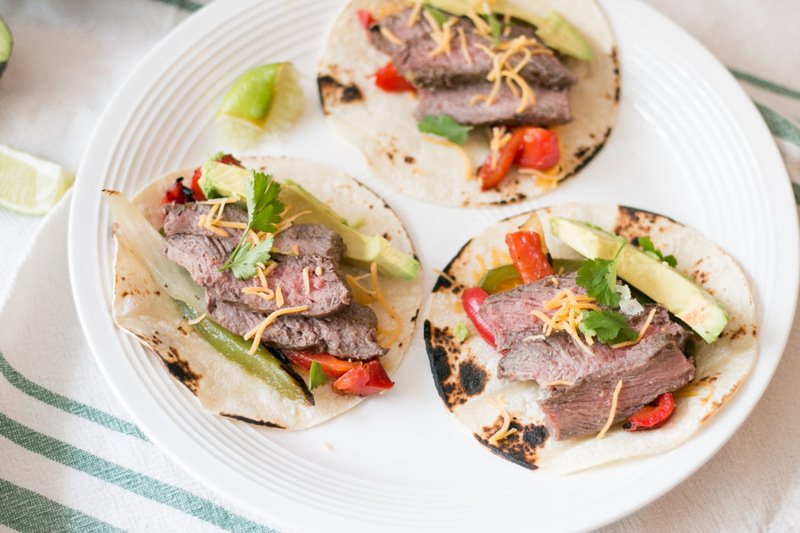 Loving this delicious recipe for steak fajitas~ I’ve got the grill ready and pinning for later! Thank you so much! I hope you enjoy them as much as we did!